And, there is also a proverb, “When it rains, look for rainbows. When it’s dark, look for stars.” Let us learn about a few exemplary women today. Sushma Maharjan was diagnosed with blood cancer at the age of 31. At the same time, her mother was sick. Hence, she didn’t dare to share her pain to her mother. She could only share her pain to her elder sister. Sushma’s mother discovered the news of her daughter’s cancer when Sushma lost most of her body hair after second chemotherapy. Sushma believes, she could actually fight cancer with better family support system. She kept herself busy in painting , handicrafts and any sorts of creative task throughout her fight with cancer. She recovered cancer after six sessions of chemotherapy for breast cancer. She could only sense relief for a short time. 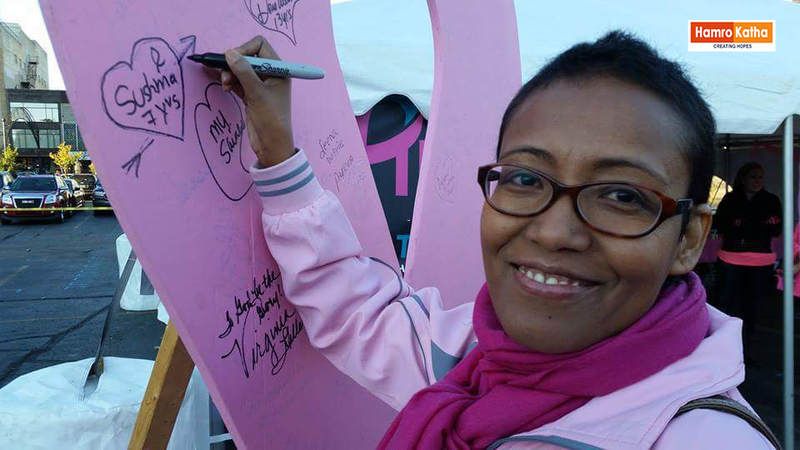 She got to know about her second recurred cancer in her breasts from a family doctor. She was in the United States then. With all her experience, understanding and determination, she fought back one more time. Victory over cancer felt much greater this time. She expresses the scars of her missing a few achievements she could have else-wise made in her life. To accomplish the dreams, she has dedicated herself to social service. She is the founder of ‘Sankalpa’, a social organization in 2003. She is continuing her social service from the organization. She is also actively involved in another social organization, Richa Bajimaya Cancer Foundation. The organization is contributing to better society through cleanliness program, conducting interaction program between specialized doctors and patients, counseling program for cancer fighting patients and distribution of clothes & recreational items for the street children. Sushma is married with a child. She also takes care of her family and her child. The next is the adjoining story of Sunita Bastola of Birtamode, Jhapa. Sunita travelled to Velor, India to take care of one of her relative. She had a random thought to get her reproductive health staying in hospital for days. She was diagnosed with cancer in the uterus in an expected manner. The doctor didn’t want to reveal her diagnosis in the absence of her husband. Her willpower and determination was tough, doctor was bound to reveal her cancer on her face alone. She decided to get herself treated in the hospital in Velor hospital immediately. The was a huge noticeable progress, she appreciated in her body after starting treatment. She still recalls the time when her mother fell unconscious visiting her in the hospital, seeing her lay in hospital bed with cancer. With her distinct willpower, she recovered cancer and is regularly doing her household chores fulfilling her responsibilities. Hamro Katha is an eminent positive storytelling platform in Nepal. Hamro Katha has been producing positive, solution focused stories about several facets of human life.